Have you heard of Geeks on a Plane? If you have, Aalto on Waves might sound familiar – except that these geeks are Finnish, and that they will travel on a ship departing tomorrow. 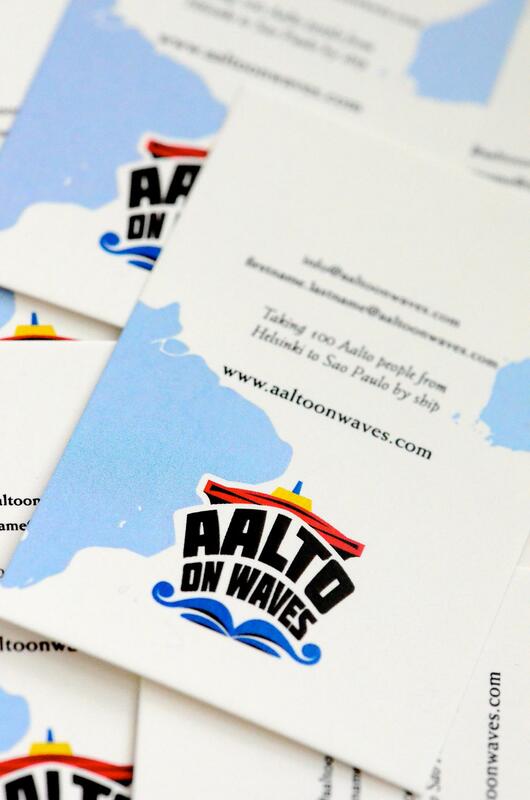 Indeed, Aalto on Waves will take a hundred participants on a cruise from Finland to Brazil to talk entrepreneurship. Aalto on Waves is actually a sequel to Aalto on Tracks, which took a hundred members of Aalto University’s community on a private train for thousands of kilometers from Helsinki to the Shanghai World Expo. Like most Aalto on Waves’ participants and its organizers, Thomas Abrell, who’s coordinating AoW’s Communications and Program team, is a student. Indeed, Aalto on Waves is what he describes as “a student-driven initiative” originating from Aalto University, one of Finland’s top higher education and research institutions. Based in Helsinki and Espoo, Aalto University was born in 2010 from the merger of the Helsinki University of Technology, the Helsinki School of Economics, and the University of Art and Design Helsinki. As a result, it is the perfect home for transdisciplinary approaches; its Design Factory, for instance, is simultaneously linked to tech, engineering, art, design and marketing. In this context, Aalto has become a fertile ground for entrepreneurship. It has a lively entrepreneurial society, AaltoES, as well as a co-working space, Aalto Venture Garage. Aalto University is also one of the backers of Startup Sauna (see an interview of the team in a sauna with our own Hermione Way). Overall, Aalto is a key player and facilitator in Finland’s booming startup scene. It’s therefore no surprise that the Aalto on Waves’ program will focus on entrepreneurship at all stages, starting on the ship itself. According to the organizers, most participants (57%) are from Aalto’s tech community, while 20% are it’s art community. During the two-week cruise, workshops will give them opportunities to learn more about the business side. For example, the ShipShop open discussion workshop will give participants a chance to pitch their ideas, learn from AaltoES’ people and find out more about Finnish support for entrepreneurship. According to Lasse Korpela, who has participated in defining activities on board, the threshold was kept low on purpose, for students with a limited knowledge of startups to be able to bounce ideas off of experienced entrepreneurs. Indeed, Aalto University is a highway to a good corporate job and Finnish students tend not to take risks, Lasse explained. For its organizers, Aalto on Waves will hopefully be an opportunity to break this barrier and promote startups as a valid option. While AoW’s first stops in Brazil will only focus on tourism to offer participants a break from their busy onboard schedule, entrepreneurship will be back on the menu as soon as the group arrives in Rio de Janeiro. According to Adalgisa Santos, another of AoW’s organizers, the team decided to focus more specifically on two aspects of entrepreneurship, which they found particularly interesting in Brazil: social and creative entrepreneurship. This focus also offers a continuation to existing partnerships between some of AoW’s backers and Brazilian players. Indeed, most activities will be conducted in partnership with local institutions, such as the universities USP, ESPM and UFRJ, as well as UFRJ’s Innovation Agency. In Rio de Janeiro, the three-day agenda’s main objective will be for participants from both countries to “exchange information about the Brazilian and Finnish arts, culture and entertainment market,” according to the organizers. Although it may sound surprising for foreigners, cultural ties already exist between the two countries – a small number of Finnish immigrants settled in Brazil from the beginning of the 20th century and the village of Penedo, near Rio, became a tourist attraction thanks to its typical Finnish charm. In Sao Paulo, activities will center on social entrepreneurship. It is an area Aalto’s International Design Business Management department (IDBM) has already been working on, and this stay in Brazil will give its students an opportunity to visit small businesses in low-income communities and share ideas on sustainability with their Brazilian counterparts. During their stay in Brazil, AoW’s Finnish participants will also learn more about the opportunities – and potential risks – of doing business in Brazil. A law and technology seminar will focus on copyright and intellectual property rights usage in the country, while Norwegian entrepreneur Egil Fujikawa Nes will share his insight and knowledge on running a company in Brazil as a foreigner. His talk won’t be based solely on his individual experience, as his consultancy firm Connection Consulting specializes in helping foreign companies enter the Brazilian market. Overall, AoW’s organizers see this trip as a great opportunity to connect Aalto with Brazil while promoting entrepreneurship, particularly among arts students from both countries, who don’t necessarily think of starting a business. Since Aalto University is well-known for its multidisciplinarity, it will focus on helping people from different horizons connect around transversal projects, from Finland to Brazil. After AoW’s activities in Sao Paulo, participants will be on their own. Indeed, Aalto on Waves is a one-way journey; everyone had to make their own arrangements to get back to Europe, and many will be taking this opportunity to continue their journey to other Latin American countries. A couple of participants will even be staying in the region for a few more months. Finnish startup, Kassi, which already took part in Startup Sauna, has been selected to participate in Start-Up Chile’s next acceleration cycle (see our previous story), and its founders have decided to take advantage of Aalto on Waves to make their way to Chile while finding out more about the region. If you’re interested in following Aalto on Waves online, its organizers have already confirmed that they plan to communicate actively during the trip and to keep Facebook fans updated from the ship. Will you participate or do you wish you could? Let us know in the comments.